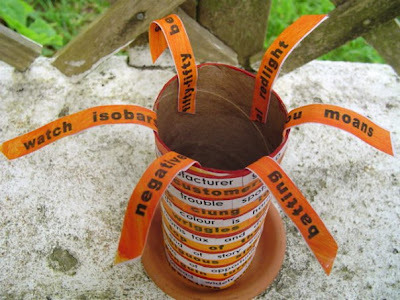 One of Tony Green's word sculptures. If you're intrigued, be sure to visit accumulations, a site I check often. Lately Tony's been adding "words that come to hand" more than his word-machines, but scroll back to earlier entries for various media. I happily own one of Tony's "sliding accumulations." I also recommend this flickr page with its nice photos of Tony's work. 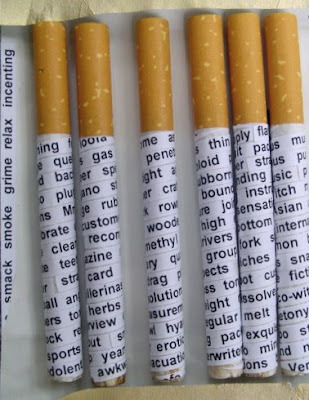 Below are some of Tony's word-smokes, which certainly confuse Jacques Lipshitz' famous dictum about why he makes sculptures - to avoid or deny death. the people in cars, do they see? do they care?